How to Transfer Data from Android to iPhone? The world of technology grows and evolve at a rapid pace every day to the extent that it has become near to impossible for man to keep up with the constant developments and innovations. Despite that, the change is inevitable and it does impact our lives to the core. One of the most household technology today is smartphones. While in essence, any smart is meant to serve the same purpose and will have similar characteristics, yet the plethora of smartphone brands have made life confusing and complicated for most consumers. One of the biggest struggles when it comes to smartphones is changing the current phone and switching to a new one. Whether your old phone got damaged or lost and you need a new one, or you are making a switch just because you were bored of your old gadget, no matter how excited you are to explore your new smartphone, there is a lot of hassle that you need to take care of. Most smartphones run either on iOS or Android. If you have decided to ditch your Android to jump on the Apple bandwagon, you will find yourself stuck with the cumbersome task of transferring the data from your Android phone to your iOS device. The biggest problem with the data transfer is that both the gadgets work on different operating systems and therefore do not support many file formats. Although iPhone has attempted to resolve this issue by developing an Android app that facilitates data transfer between the two devices, however, even the app has its limitations since it does not transfer data such as messages and music. Dr. Fone - Switch is a revolutionary, groundbreaking tool that facilitates complete data transfer between any two smartphones. The tool is capable of transferring any data, including music and messages from an Android to iPhone. Other than the data transfer facilitation, the tool acts as an excellent solution to the backup and restore issues. You can now simply use this tool to backup and restore your phone before you go ahead with formatting it or transferring its data to another phone. If you are stuck with a phone switch because of the GBs full of data that was stored in your old phone, you do not need to worry and can completely trust Dr. Phone. To go ahead with the data transfer process from one phone to another, you will only be required to follow a few steps. The first step is to download Dr. Fone - Switch to your computer. The next step is to transfer your contacts to the other phone. Before you do so, remember to sign out of any apps if you do not want the synced contacts on your new phone. Likewise, make sure you are logged in to any app whose contacts you want to sustain on your new phone. Once the contacts issue is sorted, you will have to back up and restore your phone using a simple touch. Next, run the Dr. Fone – Switch application on your computer and connect both the devices to your laptop or computer using a USB data cable. 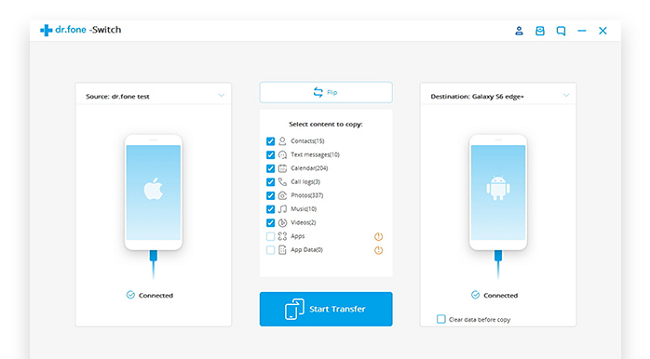 Now follow the instructions and use the tool to smoothly transfer all your data from your previous phone to a new one.